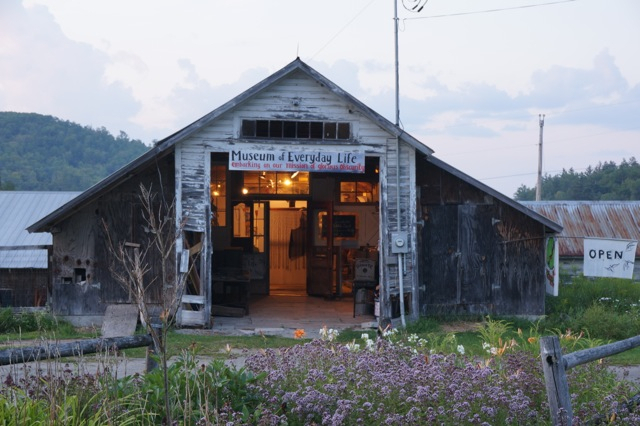 is an ongoing revolutionary museum experiment based in Glover, Vermont. Its mission is a heroic, slow-motion cataloguing of the quotidian–a detailed, theatrical expression of gratitude and love for the miniscule and unglamorous experience of daily life in all its forms. We celebrate mundanity, and the mysterious delight embedded in the banal but beloved objects we touch everyday. In pursuit of this mission, some of the questions we ask ourselves are: What would it be like to imagine a museum filled, not with exotic objects, but with perfectly familiar ones? What would it look like to defy the commodity-based model of collection and display? And how might it be possible to create massive participatory collections of objects in a way that illuminates the back and forth dance, the essential, vibrant relationship between us and them? In addition to a robust and ever-expanding permanent collection, our special featured exhibits have explored ordinary objects such as the pencil, the safety pin, the mirror, the toothbrush, the match, locks and keys, scissors, and dust. These exhibits look at the objects in-depth, tracing their origins, and additionally examining their life throughout history in relation to all kinds of human experience. The creation of these special featured exhibits involves the input of many people, from neighbors to college students, from fanatical collectors to local artists and performers, all of whom donate their time helping to construct exhibits, maintain and improve the buildings and grounds, give guided tours, and perform at openings and events. The Museum has three components: 1) The Museum of Everyday Life Philosophy Department, involving the production and publication of theoretical writing about people and their relationship to objects, curatorial methodologies, and encylcopedism, 2) The Museum of Everyday Life Performance Company, which creates puppet shows and performances in an ongoing effort to examine and everyday life via the life of objects, and lastly, but most important 3) The Museum of Everyday Life Exhibitions and Collections, comprised of actual exhibits which make the theoretical work tangible and concrete. The Museum of Everyday Life is also a collaborative partner in the BANNERS & CRANKS festival, an itinerant, yearly festival of cantastoria and cranky performance.